Mattress protectors serve an important function in any bedroom, whether you notice them or not. In fact, a good mattress protector is typically very discreet. They are soft, waterproof, quiet, and able to do the job when it matters most. For this review, we’re going to be taking a closer look at the Lucid waterproof mattress protector. Don’t miss a single step as we put the Lucid mattress protector to the test in our full review below! In a rush? Click here to skip right to the review summary. The Lucid waterproof mattress protector is a two part construction made for comfort and durability. The cotton terry top provides a soft top layer without changing the feel of your mattress. The polyurethane backing keeps dust mites, allergens, and liquid spills from penetrating the protector. This kind of protection can provide relief from allergy and asthma symptoms without the plastic feeling that is common to many cheap mattress protectors. The combination of these two layers provides a leak-proof seal between the protector and your mattress while still allowing air to circulate. FAQ: Do I need a mattress protector or mattress pad? This mattress protector comes in all standard sizes including: Twin, Twin XL, Full, Full XL, Queen, King, and California King. The fitted sheet style of this protector keeps it tightly in place and easily removable for laundering. It is important to note that the fitted sides are made of a different material (very stretchy) compared to the absorbent top of the protector. The sides also do not have the polyurethane backing which can be a problem for spills at the edge of the bed. Essentially, any good mattress protector will accomplish two things. Protect the mattress – This protection includes, but is not limited to, protection from dust mites, allergens, liquid spills, or any other damage that could potentially reach your mattress. The mattress protector is the final line of defense. Protect without any knowledge that it’s there – A mattress protector that does all of the things above is good, but one that does all of the above WITHOUT being noticeable is even better. A well-constructed mattress protector will not change the feel of your mattress, cause heat build-up or create excess noise that could rustle restless sleepers during the night. As mentioned above, the mattress protector is that last line of defense against potential mattress damage and one of the most frequent threats are liquid spills. 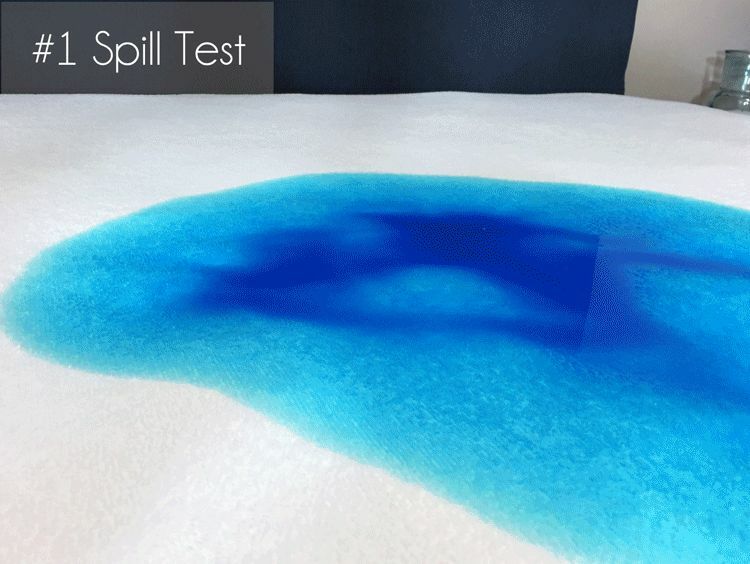 It only takes one spill without a good protector to completely ruin a mattress. To really review the performance of the Lucid waterproof mattress protector, I set up two distinct scenario tests that tracks how this protector performs against liquid spills. This spill was obvious and blatant. You likely saw it happen or you may have caused it yourself. Regardless, you ran for the paper towels and immediately tried to clean up the mess before it had a chance to soak into the mattress. The liquid has two minutes max, before you will have likely soaked up the majority of the spill. You’re quick to react… but will you be quick enough to save your mattress? 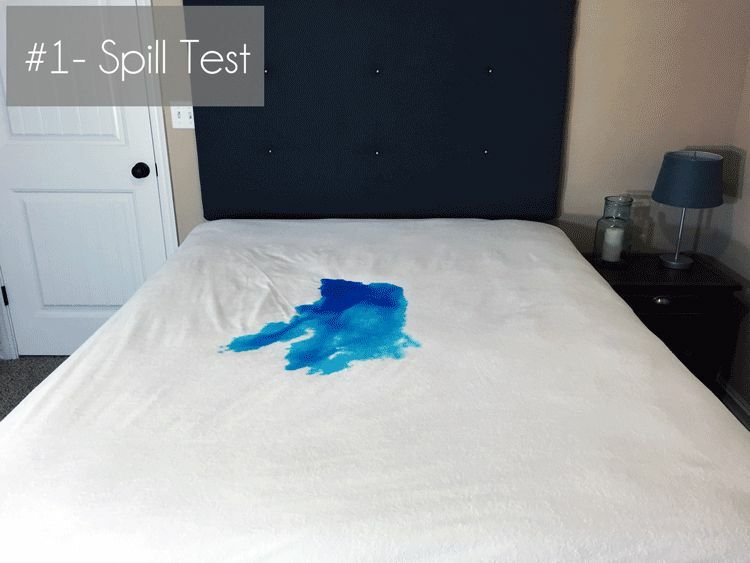 Spill test – To act out this scenario, I poured 16 ounces of water with food coloring (so I could easily see any liquid penetration) and allowed it to sit for 2 minutes before blotting it with paper towels and cleaning up. Paper towels – A layer of paper towels was placed directly below the spill area that helps to identify any areas where the liquid may have soaked through. So far so good. This spill was more mysterious. It may have been the dog, or maybe the sick child who crawled into bed late last night. The stain has had hours to soak into your mattress protector and you cringe at the thought of peeling it back and seeing the mattress below. Is there any hope left for your bed? Spill test – To reenact this scene, I poured 16 ounces of water with food coloring (so I could easily see any liquid penetration) and allowed it to sit for 8 hours before cleaning up. After two hours, the spill had nearly tripled in size. Also, note the side of the bed. I had this protector on a queen sized bed and after two hours the spill had soaked into the side wall of the protector. Had we not had the paper towels below the protector, this spill would have soaked into the side of the mattress below. Paper towels – Despite the failure at the side, the layer of paper towels directly below the spill showed no sign of leakage. While it’s hard to judge the presence of allergens, dust, and dirt in such a short testing period, I can say that this product has the durability to perform well in this category. The top layer of cotton terry material is soft, but not too plush as to create a home for beg bugs or dust mites. The polyurethane sub-layer feels like a relatively slick material that would be extremely resistant to bugs, dirt, and allergens. In addition, the stretch 12” fitted sheet sides provide a tight fit for your mattress and box spring. For beds without a box spring, you may find that this mattress protector fits a little loose. It’s stretchy so you can easily pull and tuck it under the mattress for a tight fit, but it’s not ideal. When used without a box spring, I do not think it would perform as well at keeping the dust and allergens outs. As mentioned above, a mattress protector needs to protect the mattress, but it also needs to do so silently while not affecting sleep quality or feel of the mattress beneath. Some mattress protectors seal out liquids from penetrating, but they also restrict air circulation, retain heat, or create excessive noise. 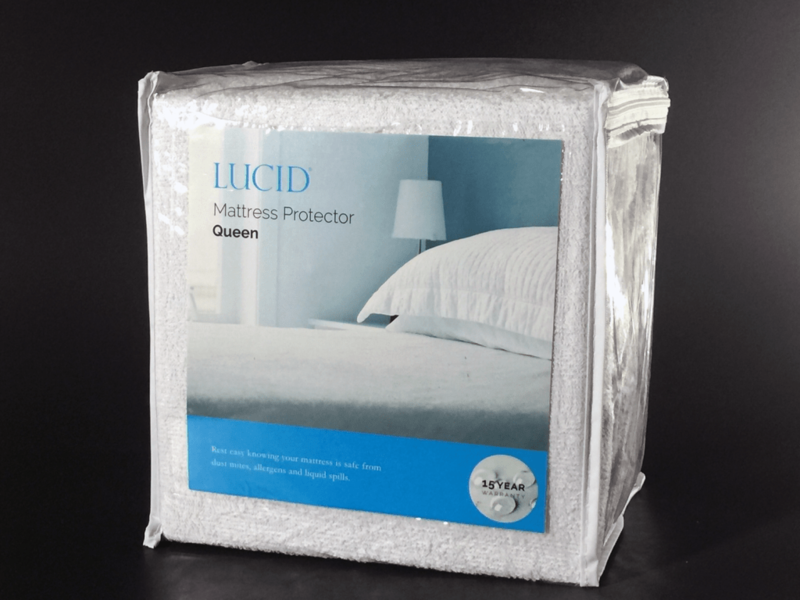 In the case of the Lucid waterproof mattress protector, it does a fairly good job in noise and cooling. The polyurethane sub-layer sleeps very cool and allows adequate air flow. Depending on the type of mattress you have, you may notice some noise due the slick nature of the polyurethane. 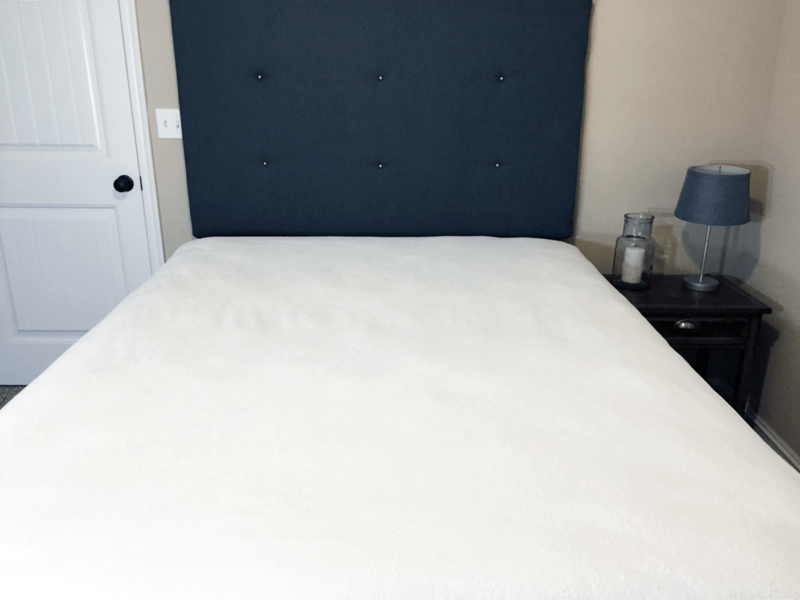 For this review I tested the protector on a foam mattress with a pillow top and also a traditional innerspring mattress. When placed on both beds, we noticed the sound to be diminished on the pillow top mattress and slightly more noticeable on the older traditional innerspring mattress. Once the bedding was on, the noise was very muffled. Should you buy the Lucid waterproof mattress protector? Overall, I would say the Lucid waterproof mattress protector does a great job of accomplishing the objectives of any mattress protector. Excluding the leakage at the sides, there was no sign of liquid spills penetrating the mattress protector. Also keep in mind, these spill tests used 16 ounces of liquid, with no sheet or other bedding on there to help soak up the liquid before it has a chance to reach the side of the bed. The presence of this protector had little effect on breathability, heat transfer, or excess noise. I think over time, this mattress protector would perform well in keeping dust mites and allergens out of the mattress. Want maximum liquid protection– After 8 full hours of soaked in stains, this protector didn’t allow any liquid to penetrate the mattress, with the exception of the weakness at the side walls. Despite the side wall failure, it washed out completely. Keep in mind, these tests used two full cups of liquid without any additional bedding. This is an extreme case for a spill on the bed and additional bedding present would have helped to keep the spill from expanding to the edge of the mattress. If you like the price point and performance of this protector, but want stronger side panels check out Lucid’s 5-sided protector. Want to protect against allergens and dust mites – The durability of the polyurethane backing and fitted sheet style are great ways to limit dirt, allergens, and dust mites from penetrating your mattress. 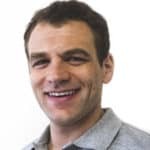 Want a mattress protector that doesn’t feel like a mattress protector – If you judged a mattress protector by its looks and price, you might think that this protector wouldn’t perform at the level it does. However, our tests showed a protector that gets the job done even under the most extreme scenarios. The soft cotton terry top feels plush and more like a flannel sheet than a scratchy mattress protector. The polyurethane sub-layer is smooth, discreet, and virtually invisible until you need it to stop a stain. For more information and to buy check out Lucid on Amazon.com. The Lucid waterproof mattress protector is quite impressive. From managing spills to minimal noise, this mattress protector is all around well constructed. With a soft cotton top cover it doesn’t feel like a traditional plastic / rubber protector. Although it showed small signs of leakage on the sides, there was no liquid penetration to the main parts of the mattress. All in all, the protector sleeps very cool and has a great build quality.